Don’t we all want to make money? People say money doesn’t buy happiness, but wealthy people are a whole lot happier than poor people. It’s because with money you have freedom. You can afford to take a vacation of your choice. You have the freedom to go hiking for a week because you aren’t living paycheck to paycheck. With Uber, you have a different kind of experience. You have the freedom to set your own hours and work as many as you so choose. There are hundreds of thousands of ordinary people, like you, across the world driving for Uber. Some are teachers, others are students. Moms, dads, brothers, and sisters all creating some kind of income through Uber. Whether it’s to just have enough money to pay your car payment or you are working full time and just want to enjoy the flexibility of working your own hours. Uber can create unique situations for everyone. It just all depends how you want to look at it. 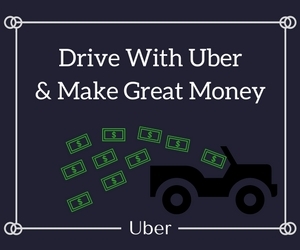 Today, I wanted to talk about the 5 different kinds of methods people are using to make money driving for Uber. Some methods you already know, and other methods you might not have thought of until today. So, read on to see the different ways you can make, or create, extra income using Uber’s platform (does not have to be specifically driving either). Most people that have heard of Uber knows it started as a rideshare service. Once you sign up for Uber it’s as simple as going online in the partner app and waiting for a ride requests. Once you accept and pick up the rider you will be getting paid 70-80% of the total fare for the ride. The cost is based on X amount per mile and X amount per minute in the car. It varies city to city so I couldn’t give you an exact price point. Most people that make money from Uber do it through Uber’s rideshare platform which is the most popular way to make extra cash (especially during the holidays). This is one of the most lucrative opportunities to make money from Uber. While the sign-up bonuses will change month to month, In San Francisco I have seen them range from $300 all the way up to $1,400 for one person signing up through your referral link and then completing a certain required amount of trips. A lot of Uber drivers actually hate these bonuses because they believe that all this cash will cause their market to become flooded and over saturated with new drivers. This means in the long run drivers aren’t getting as many trips and making as much money with the added extra wheels on the road. In my opinion, I don’t believe this is the case. I think it’s crazy to leave this kind of money on the table. Because in the rideshare industry there is a high turnover rate. Half of Uber drivers quit within the first year of driving for them. So, while one driver is applying and uploading their required documents another driver has decided to move onto other things and call it quits. Uber Eats is the GrubHub or Eat24 of Uber. If you aren’t into picking up and dropping off passengers or you’re trying to supplement your income while there’s low demand for Uber rides then this could be an option for you. Uber will give you ready-made meals to deliver upon requests or you will pick up meal requests from local restaurants and then deliver them. You will receive a base pay per hour ($13ish) as well $3 per delivery you take. You can deliver food driving your car or deliver around town with your bike. Food delivery and Ridesharing isn’t the only two markets Uber has tapped into. They’ve also created UberRush, your personal courier, delivering your packages with a push of button. Maybe you forgot your raincoat on a rainy day. UberRush drivers can get it for you for a small fee. Not only that, local businesses and big brand names like Nordstrom and T-Mobile have partnered up with Uber allowing same-day delivery for their customers. While I have not personally tried UberRush, it’s always another option to have. On those slow days in the city you can make extra cash by driving for UberX and UberRush. At the moment UberRush is only located in Chicago, New York City, and San Francisco, but does have Toronto listed as a city to sign up in. If you have tried the service, leave a comment below and let me know about your opinion. While at the same time you make money driving for Uber, some drivers have gotten creative with their own ways of making even more cash. One Example would be Gavin Escolar, the driver that made $252,000 in a year selling jewelry out of his Uber car. Dubbed as an “Uberpreneur” Not only did he make that kind of money, he also expanded his jewelry business by purchasing more cars and hiring more drivers for his Uber fleet. While he didn’t originally have this idea in the beginning, a light bulb went off in his head, and he came up with a genius idea of showcasing his jewelry out of his car with huge profits to show for it. A second example would be Harry Campbell. If you have been interested in Uber for a little while you might’ve heard of him. He runs a website called The Ride Share Guy. The website is an informational blog pretty much about everything rideshare related. He’s made thousands from Uber referrals, Google Adsense, many different affiliate programs, as well as Uber driver training he created with another Uber driver named Brian Cole. The training alone that Brian Cole and Harry Campbell created made about $12,000 within the first few months of launch. Uber isn’t the only player in the ballgame. While they may typically be the biggest, having your portfolio diversified is strategic. Lyft is one of Uber’s biggest competitors and a rideshare platform that many drivers actually prefer driving on. The pay per ride can typically be higher because Lyft app has a tipping option for riders, The company overall tries to be more “driver friendly”, not only that you can get a sign up bonus(Click on my link for Lyft’s sign up bonus) for driving for them as well. There’s also a company like Juno that has put aside 50% of their stock for the drivers and is promising better commissions. They are only in NYC right now, but will be expanding rapidly soon. It appears that you need a referral code in order to sign up, and Juno will notify drivers once they have arrived in your city. I recommend you sign up for Juno now, since it will probably be most lucrative in the beginning. While there are many different ways of making money using the Uber platform, it’s all about being creative. There are some lucrative ways to make a large amount of money to live comfortably on and people like Harry Campbell, Brian Cole, and Gavin Escolar is just a few of the people that have taken advantage of this ridesharing economy. So, the next time you are looking to create a larger income just think about what some of the entrepreneurial-minded people are doing to increase their income. Have a question or thought? Leave me a comment below. How do I get employed to drive the Uber Health? If your car qualifies for uber select – are you automatically just an uber select driver? How does that work – Id prefer to use my luxury vehicle for uber select rates only. In order to become an Uber Select driver you have to start as an UberX driver. Every city varies on requirements, but most require around 50-100 trips before you can be upgraded to Select. After this time, providing your driver rating is good, you can then send Uber support a message about upgrading. You can sign up to drive through this link.